How do I get a number assigned to a new light? How does the ARLHS define a lighthouse? What are suggested ARLHS calling frequencies? What are the rules concerning use of the ARLHS logo? What happens if I let my membership expire? What if I am within sight of two lights? What is meant by activating a light? 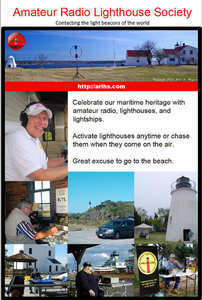 What Is the Amateur Radio Lighthouse Society and How Do I Join? What is the Visual Sight Rule? Where can I get a list of lights and ARLHS numbers? KX4O will be at the Manassas Ham Fest June 19th with a large poster sharing a table with the Virginia Packet Network. The goal is to provide eye candy for the ham patrons and let them know the fun we have activating and chasing lighthouse. ARLHS Store Amateur Radio Lighthouse Society member products with the society’s logo. © 2019 ARLHS, LLC. All rights reserved.